You can visit our devilish residents in their fantastic home, New Zealand's largest Tasmanian devil habitat, right here in Christchurch! Orana is one of only a select number of zoos internationally to be part of the Save the Tasmanian Devil Program. An offshore population is being established as a backstop should the disease currently affecting wild devils not be contained. Orana's role is to support the Program through conservation advocacy – educating the public on the plight of these animals. One way Park visitors can directly assist is to purchase Tasmanian devil themed merchandise from our souvenir shop. Proceeds are directed towards further researching the disease that is currently threatening the survival of these endangered marsupials. 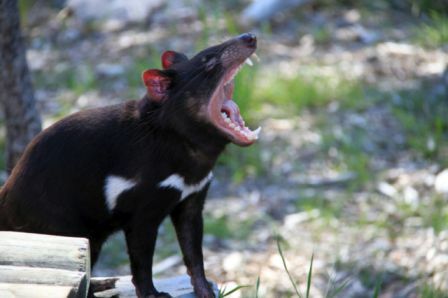 To learn more about devils and to gain the best views of these animals, be sure to catch the Tasmanian devil presentation at 1.50pm on Tuesdays, Thursdays and Sundays.